We are extremely delighted to announce the 63 glorious years of Yamaha in the two-wheeler industry. The celebration marks our success and growing popularity, milestones and memories that have been created over the years. We look forward to excite our stakeholders, while offering the most stylish and sporty products, that have revved a million hearts across the globe. In India our entire focus will be to make a difference by offering more appealing bikes and scooters to our customers and make all efforts to increase the brand presence. A New Vision Document and the Brand Direction of the Yamaha Motor India Group Cos. was also unveiled on this occasion. This year the celebration entails, bringing-in the blue color that is synonymous with Yamaha Motor Racing as a part of internal corporate set-up as well as external retail landscape. The pan-India Yamaha dealerships also joined the celebrations with an objective of highlighting the excellence in personal mobility to the visitors and customers. 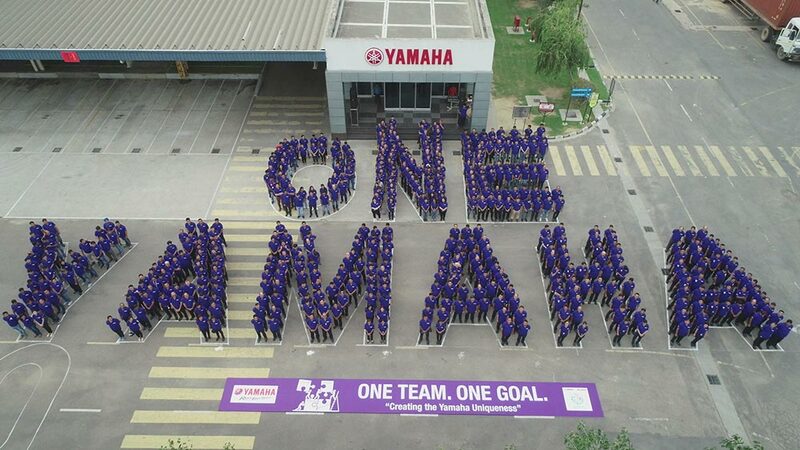 The employees at Yamaha’s Chennai, Surajpur and Faridabad factory expressed their commitment towards the company’s vision by forming a ONE YAMAHA structure. On this day in the year 1955, Yamaha Motor Company in Japan began the production of its first product, the 125cc motorcycle “YA-1“. The grand success of the “YA-1” model highlighted the reliability of Yamaha’s technology and steadily helped the company to expand its presence across the globe with a range of exclusive and trusted products. Moving forward, the company envisages to establish a strong market presence through its sporty and stylish products which creates a sense of excitement among the customers.